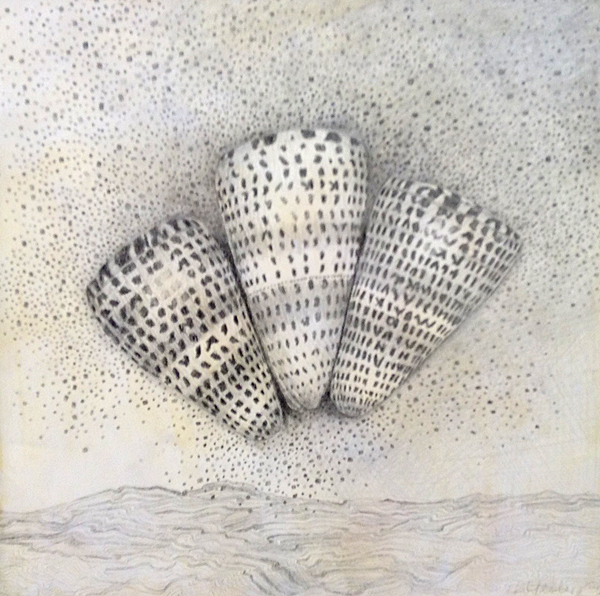 Julie Powell has been obsessed with textiles since she was 16 years of age. After graduating from Bowdoin College in Maine, with a major in English Literature and Art (with a focus on textiles), she began her own business, selling hand knit sweaters with hand dyed wool, mohair and silk. 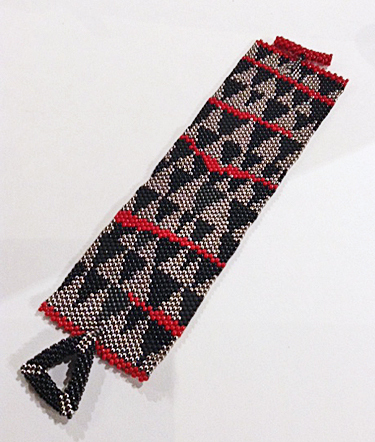 She later incorporated weaving into her business and created jackets, coats, shawls and yardage for other designers in the Bay Area. This business grew to 50 women knitting sweaters which sold to stores like Henri Bendel, Saks, I Magnin, Nordstrom and many small boutiques. In 2002, she became Director of Design and Merchandising for Icelandic Design in Colorado, traveling globally for inspiration, sales events and overseeing production. 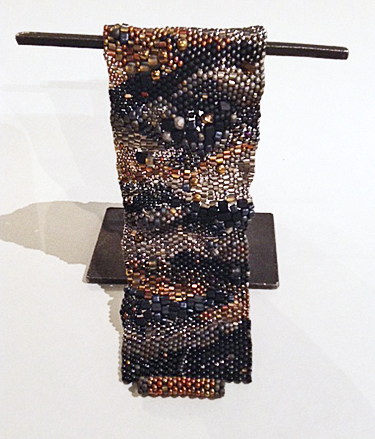 In 2008 she began to experiment with beadwork and embroidering, weaving with small seed beads to create jewelry. In 2013, she became designer for Lost Horizons, creating a collection of hand knit accessories and sweaters in Nepal. 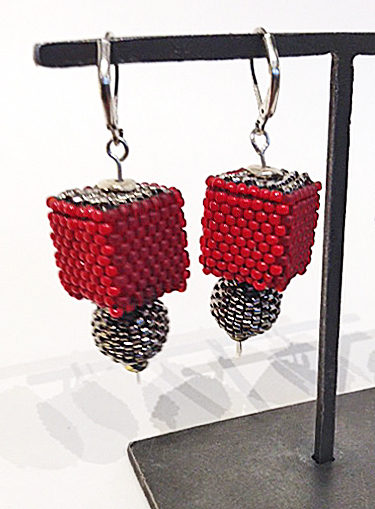 For her own beaded jewelry, she won a Choice Award at the Smithsonian Institution show, Craft2Wear. Teaching has always been part of her equation and she has recently led workshops in Turkey with Syrian refugees to focus on beadwork and products they can market in the EU and US. 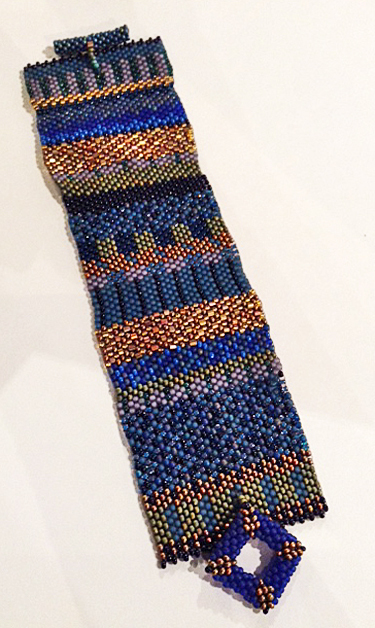 I weave and embroider tiny glass beads, with a needle and fishing line, one bead at a time to create intricate cuffs, necklaces and earrings. The process takes many hours. Every single bead I pick up is a choice, one element in shaping the whole. The rhythm of touching each bead to the needle and pulling it through to connect to the next bead is meditative and fascinating to me. 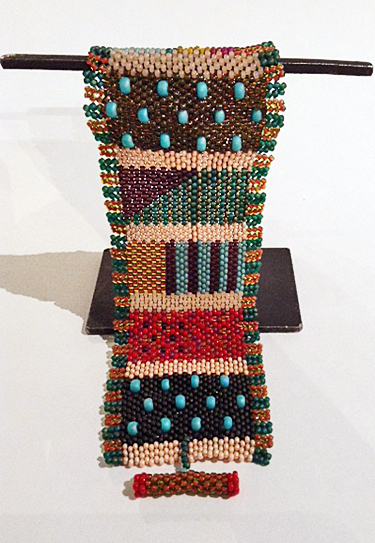 I view my beadwork as a fabric. 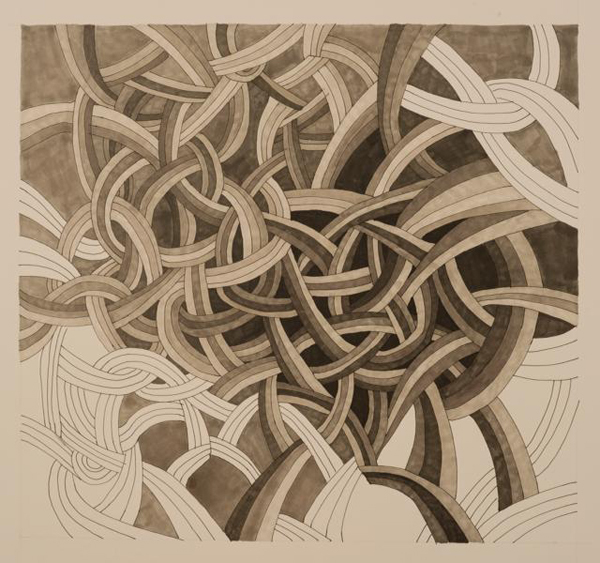 Like woven fabrics, the colors play upon each other and have a rich, complex surface. My pieces are flexible. They move. They are light. They drape like a scarf, ribbons. I am interested in creating texture that is dynamic and evocative of the natural world – rocks, mountains, rivers and forests. 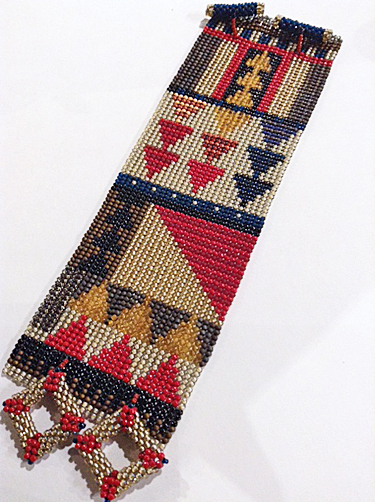 I also am drawn to the traditions of beadwork and folk art from many cultures – Africa, Asia, Europe and Native America. I am inspired by these cultural touchstones and they spur me to create new work – and to push boundaries. I take these traditions and push them into a contemporary direction, preferring to emphasize color and form rather than complicated stitches and patterning. I am inspired by the natural world, from the mountains and rivers to the oceans and sky. Hand beading. Ecru/red/blue. Please contact the Gallery for further information. Hand beading. Black/red. Please contact the Gallery for further information. Hand beading. Lapis/gold. Please contact the Gallery for further information. Hand beading. Mixed-up peach/olive. Please contact the Gallery for further information. Hand beading. Please contact the Gallery for further information. 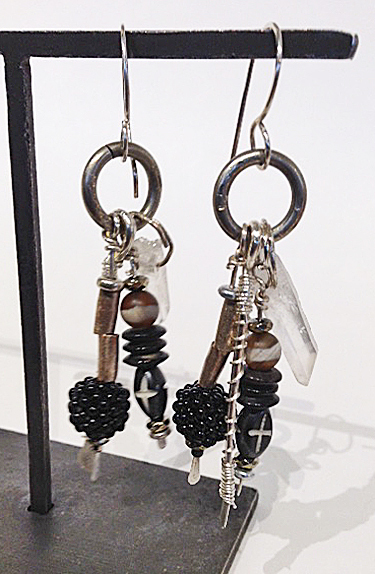 Seed and other beads, black and silver, with sterling silver components and sterling silver ear wires. Dimensions: 2.25" dangle. 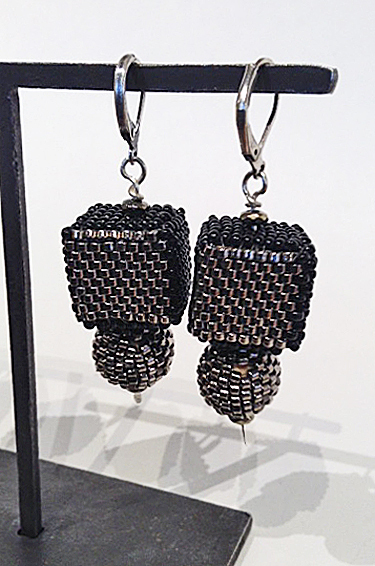 Black and silver, seed beads, sterling silver, with sterling silver ear wires. Dimensions: 2" dangle. Red and siler. 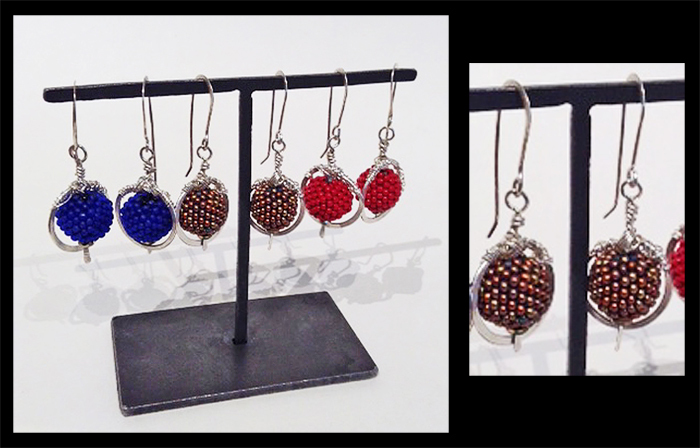 Seed beads, sterling silver, with sterling silver ear wires. Dimensions: 2" dangle. 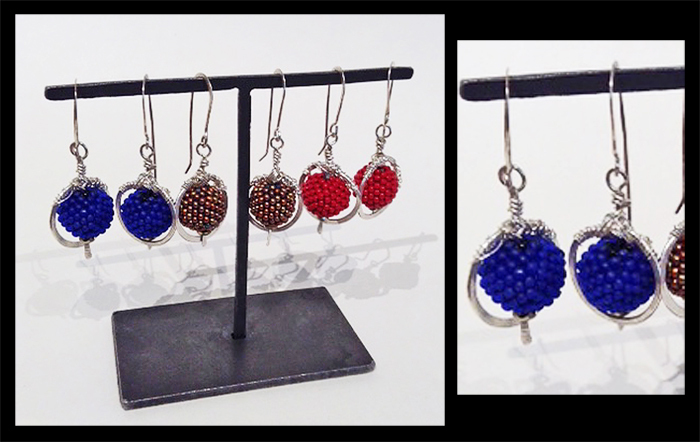 Seed beads, sterling silver, with sterling silver ear wires. Dimensions: 1.5" dangle.